Former PM fires back at Netanyahu who mocked him during a speech in Tel Aviv. Left blasts Likud support rally. 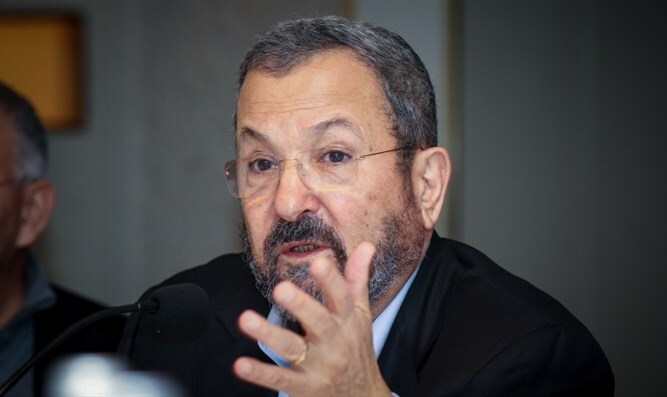 Former Prime Minister and Defense Minister Ehud Barak responded on Wednesday evening to Prime Minister Binyamin Netanyahu’s speech at a support rally held for him in Tel Aviv, saying that eventually Netanyahu will be forced to resign. “The suspect from Balfour continues to whine. The Likudniks are proud and honest citizens. Not puppets. There is no persecution, there is corruption. There is no leadership, there is panic,” he tweeted. "The supporters show emotional sympathy - but when the testimonies of the state's witnesses are published, the game will be over. This is neither persecution nor a political dispute; this is a personal and systemic corruption. Who will really believe that the Attorney General and the Police Commissioner are persecuting the Prime Minister?" added Barak. In his speech, Netanyahu charged those attempting to bring him down with also attempting to bring down the Likud party and the right-wing government in Israel. She added, "When Netanyahu claims that the law enforcement agencies are operated by the left, he de-legitimizes the law enforcement systems." Also condemning the Prime Minister’s speech was opposition leader MK Yitzhak Herzog. "Netanyahu's horror show tonight is a test for the rule of law and Israeli democracy. Netanyahu’s tongue-lashing was embarrassing, humiliating, and dangerous. The public on the right, center and left knows that the time has come to replace Netanyahu. The public is fed up with the sense of individual rule and is loath to the threat that Netanyahu's words have caused to Israel's free, enlightened and healthy democracy," Herzog said. Zionist Union chairman Avi Gabbay said following Netanyahu’s speech, "The people of Israel saw this evening a helpless Prime Minister attacking the prosecution and the police, whose heads he himself appointed. The Prime Minister will divide and try to divert attention from the handicapped and the real problems of the people of Israel, and we will unite and bring back the leadership that the people need." "The support of Likud Central Committee members for the corruption of the Netanyahu family does not reflect the opinion of Likud voters who, like all Israelis, pay the price of corruption in the form of lacking civilian services, traffic jams, impossible housing prices and young couples who are afraid to start their independent lives. Netanyahu keeps claiming that the people are with him. I call on him to check this out in the form of national elections as soon as possible,” added Gabbay.